Anyone who has been reading my stuff knows I’ve been lusting after a bolt action rifle with a threaded barrel longer and more passionately than Farago’s been pining for a date with an Israeli model. Specifically, I’ve been Jonesing for the Remington 700 SPS Tactical AAC-SD. Unfortunately for me, so has everyone else . . .
I’ve been trying to get an AAC-SD through Remington’s T&E peeps for months. Not even Mike Mers, AAC’s resident superstar, could convince Remington to release their iron grip on the gun. The AAC-SD’s been flying off the shelves; Remington didn’t want to deprive a single customer for PR purposes. So when I spied a factory-fresh Rem 700 AAC-SD in a local dealer’s inventory, my credit card practically melted in my hand (not in my wallet). Some $650 later I was walking out to the parking lot AAC-SD’ed up. The standard Remington 700 SPS Tactical comes with a straight black stock. The AAC-SD’s is green with flecks of color and swirly stuff. It looks pretty as a picture and helps the long gun blend in with the local vegetation when hunting. But the AAC-SD’s stock still suffers from the same pet peeve I’ve had with almost every gun I’ve reviewed recently: the stock’s comb is too low. I get a chin weld instead of a cheek weld. You’d think that a little higher comb would be called for on a gun that doesn’t even have an option for iron sights. Apparently not. The ACC-SD’s stock feels plenty damn grippy thanks to the rubber Hogue material surrounding it. And the rifle’s recoil pad does a great job of reducing what recoil remains after the silencer has done its job. Another disappointing note: the stock touches the barrel. A free-floating barrel improves accuracy; there are no external forces acting on the barrel as it moves and the black magic of barrel harmonics remain undisturbed. When a stock touches the barrel, it changes its position and tends to have a negative impact on accuracy. It’s a quick fix, but it would be nice if the factory stock had a little more rigidity where it counts instead of bending like a fat kid trying to do a push-up. The AAC-SD’s trigger is smooth as polished chrome to the touch, as crisp as a fresh head of iceberg and as generally pleasurable as one of RF’s non-sexual metaphors. Unfortunately, Remington has placed the trigger’s adjustment screw directly into the trigger. Nicer 1911 models do the same thing, but they artfully recess the screw into the trigger shoe. The Remy’s sharp-edged adjustment screw sticks out. It’s like having something stuck between your teeth: not life threatening or terribly uncomfortable, just annoying as all hell. Remington has been perfecting the 700’s action since the early 1940’s. The highly evolved bolt handle is ergonomically sound and pleasing to the touch. Its operation is endlessly reassuring but it doesn’t feel as smooth as some of the other rifles I’ve tested lately (e.g., the Weatherby rifles, the McMillan CS5, Mossberg 100 ATR). That’s probably down to the Remington’s black powder coated bolt. I get that the black is all tactical and stuff, but it just makes the rifle feel . . . cheap. The AAC-SD’s internal magazine holds four rounds (a fifth can be loaded in the chamber). The floorplate release is inside the triggerguard. There’s a thumb safety (my favorite position). And the rifle’s receiver comes drilled and tapped from the factory—with no pre-attached bases. The AAC-SD has a heavy profile barrel — emphasis on the “heavy.” Seriously, this barrel is heavier than Paula Deen’s taste testers. And for good reason: heavy barrels resist the effects of temperature change and improve shot-to-shot accuracy. Which helped when the round count at the range passed 100 cartridges in a single sitting. A heavy barrel also resists movement due to external factors, such as a stock that makes contact. And so to the important upgrade: the gun’s 5/8-24 threaded muzzle. It’s ideal for AAC’s 51-tooth mounts or any other compatible silencer manufacturer’s device. A silencer makes all the difference between this gun and a standard .308 Winchester rifle. I’ve had more fun shooting this rifle than any other .308 I’ve shot this year with the possible exception of the McMillan CS5 the other week. Recoil is damn near nonexistent. The lack of a loud “BANG” makes it easier to focus and eliminates aural discomfort for surrounding shooters. In terms of accuracy, I was getting 1 MoA accuracy out of the AAC-SD with 150 grain handloads. Patrick Carrube out in Arizona had similar results with his budget precision rifle build that I inadvertently inspired with my failed 1,000 yard rifle for $500 project. With heavier rounds accuracy will only improve. Why heavier rounds? While most .308 rifles use a 1:12 twist, the Remington 700 SPS Tactical AAC-SD uses a slightly faster 1:10 twist designed for heavier (well, LONGER) bullets. So 150 is the lower limit of what the gun should accurately shoot. Once I had some 200 grain rounds cooked up I brought her out to the local 1,000 yard range and promptly nailed the 250, 500, 750 and 1,000 yard steel gongs. 1,000 yard gun? Check. Some companies haven’t flourished under the Freedom Group’s ownership (*cough* Marlin *cough*). Remington’s 700 series remains a fine rifle with a few minor niggles that don’t detract from its fundamental fitness for duty. The threaded AAC-SD version makes perfect sense in this application, opening-up new possibilities for stealth, health (fewer dBs) and control. Bottom line: if you’re looking for a relatively cheap but accurate bolt action rifle that can put your silencer to work, the AAC-SD is a bullseye. If you don’t have a silencer, if you’re simply looking to put rounds on target, you can buy a factory fresh Weatherby Vanguard S2 and kit it out for less than a standard Remington 700, let alone this one. Tell me again: why don’t you have a silencer? 1 MoA right now as far as I can tell, but given a few tweaks to ammo choice and some slight improvements to the gun, I believe this will be 1/2 MoA capable. At the very least we know its capable of tapping the 1,000 yard target at my local range. The comb on the stock and the adjustment screw on the trigger knocked off a star each. Caveat: WITH a silencer attached. Excellent muzzle brake. Issues with the adjustment screw and comb continue to impede the results. The Remington 700 series has so many aftermarket parts and mods you can make it do anyything you want, save full-auto. Great value-for-money for silencer-ready shooting. Not quite as great without the can. 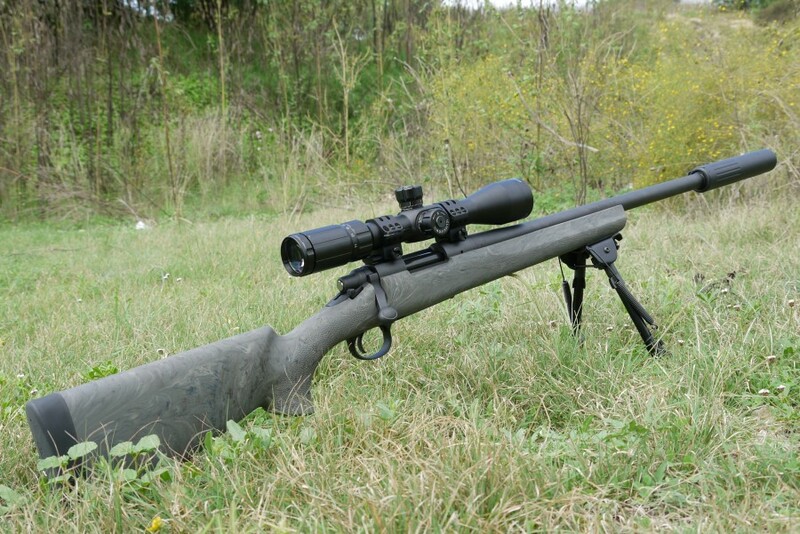 I should show you a Remington 700 SPS tactical that belongs to a a freind of mine. He’s been using it and it’s AAC silencer pretty hard for about 2 years now, and he’s never cleaned it. Ever. (he’s a Cajun, apparently they don’t like to clean ANYTHING) the action is slam full of gunk and rust, the bore is almost coated with residue, the silencer rattles when you shake it (?! ), and the surface has a nice patina of swamp rust. But, it still makes MOA groups at 100 yards, cycles semi-reliably, and the silencer still brings it down to hearing safe levels. It is by far the dirtiest gun I have ever encountered, and it wrenches my heart to see it suffer. But, it’s a cool reliability experiment. I love my 700 AAC-SD. I through away the trigger and dropped in a Timney #510 trigger that took 10 minutes to do. Last weekend I shot a dime size 5 shot group at 200yds using a 168gr Matchking, LC brass, CCI Primer, and R-15 43.5gr. I still do not like the flex in the stock. It’s getting tossed next. Great Gun for the price. It’s the 308 by the way. I dont have one because silencers are the ONE thing that Minnesota frowns upon, firearm-wise. yep same reason i dont have one here in nc each county sheriff is the one who decides to either allow his signature to let you get one or not and in most counties it is NOT with capitol letters. hell we even had our’s here in johnston go to battle with one of our local gunshops owner who is a class III who wanted to bring in his full auto and the sheriff was saying no way you cant have it it is illeagl. much to the sheriffs dismay he couldnt really stop him and he did thogh they put 2 deputies outside the store to harrass the shop and anyone who went in. You need to look into a NFA Trust, commonly called a Gun Trust. The benefit of a Trust is that a group of people, family and trusted friends take ownership of the Title II item ( suppressor, short barrel, full auto weapon) – vs – putting the item in your name. Benefits of a NFA Trust? If you die the ATF cannot take it because the item belongs to your Trust (Wife, child, dad, brother, BFF) and allows them to pass it along as you requested. If you have a brush with the law you may lose the right to own the Title II item but the ATF cannot take it because it belongs to the Trust. A Title II item can only be used with the owner present, so unless you have a Trust your family cannot have access to or use a Title II weapon, effectively disarming them. The part that affects you is a Trust does not require photos, finger prints or the Chief Law Enforcement signature of approval. So the backwoods Sheriff has no say in who owns a Title II weapon. As long as you are legally allowed to own a handgun, you can own a suppressor, the following states allow private ownership of suppressors: AL, AR, AK, AZ, CO, CT, FL, GA, ID, IN, KS, KY, LA, ME, MD, MI, MO, MS, MT, ND, NE, NV, NH, NM, NC, OH, OK, OR, PA, SC, SD, TN, TX, UT, VA, WA, WI, WV, and WY. Even if you live in one of these states, you should verify that owning a suppressor is legal in your area. Get a lawyer to draw up the paperwork about $200, get everything notarized and find a local Class III dealer. Then pay the ATF their $200 tax stamp and wait about 9 – 11 months for approval. Ignorance is no reason for the law. But there is no reason NOT to grab the 700 AAC instead of the basic tactical for three good reasons. One it’s already threaded and there are plenty of good muzzle brakes on the market that help .308 recoil. Two the AAC model is 1 in 10 tist where as all the other tactical or varmints are 1 in 12. Third suppressors laws here in MN might change. This exact model is the best out of box sniper there is and being the aftermarket options are limitless you can make this into a monster. I threw on a McMillian a-3/5, JP brake and nightforce scope and rings and with fed gold or laupa base this shots 1/4 MOA and can get out past 1,000. I think if left stock 1/2 MOA and 1,000 yard potential. You need to buy yourself a Borka torque wrench for scope bases and rings. One of my favorite and most often used tools. Nice looking gun. Actually reminds me of an idea I’ve had floating around for a few weeks: take a Mosin-Nagant carbine, thread the barrel, put a silencer on there with Windex or a similar ammonia solution in the silencer. Idea being to tame the infamous blast and kick of the carbine while somewhat protecting the silencer from the corrosive gasses. I have no idea if this is possible, however. Not sure if you can just cut threads into an already made barrel, if the usual 7.62 silencers can handle the extra pressure of the 7.62x54R rounds, if the ammonia solution will do squat to protect everything, or what happens to an ammonia solution when heated to 1000 degrees or whatever temp the gasses are (been awhile since I had chemistry). Off-topic, but can anyone comment if this is possible? Also, you seriously need to start interrogating firearms manufacturers about this whole cheek weld problem. What the hell? Stocks on factory standard rifles and shotguns are fitted for the mythical “average man”. Another version of “one size fits all” which doesn’t. More than that, jwm, their stock dimensions are for the “average man” of about 50+ years ago. Thanks to better nutrition and genetics, American males’ average size has increased in the last 50 years. This is why people who have the disposable bucks will order custom rifles from custom gun makers. When I say “custom” – I don’t mean that a ‘smith took this barrel, slapped onto that action and then put the whole thing into some pre-configured stock. No, I mean the truly custom gun maker will make the stock from a board of walnut after measuring the customer, set the pull, drop, cast off (or on, for left handers), toe-out (especially for women), pitch and foreend slope to the customer’s needs. When you handle a gun that truly fits you, you can handle much more recoil than you previously thought possible. Most factory guns have horrible stocks. Absolutely horrible. Especially the synthetics. Or just shoot non-corrosive ammo and ditch the ammonia. Cool idea though. Almost anything is possible if you have enough money. If you really wanted to deal with the corrosion issues in the ammo, then have the can made out of 3xx stainless instead of 4xx stainless. I love Mosins. But part of their charm is they’re cheaper to buy than a good .22. Buy a Mosin and do some simple, cheap fixes like corking the barrel and action, opening up the rear sights and doing a little light emory board work on the trigger parts and you have a rugged simple fun gun to play with. If you’re going to do any more than that it’s time to move up to a better quality, more modern design. That was purely a goofy idea that came to me falling as I was falling asleep. I was just curious it was even possible. At any rate, thanks for indulging my idle curiosity. I’ve got the same rifle, with an HS stock (Horiuchi, I know, but it was a good deal used) and without the threads. Lace a Blackhawk cheek rest on and it will give you a perfect cheek weld and a place to stash your range book. I’ve had great fun out to 300+ yards, but the 20″ barrel takes a slight toll on velocity. Past 500 yards I haven’t had great success yet, but I haven’t experimented much with loads and I need a better scope. With 175-grain SMK/AMAX rounds, you should be able to hit 1000-yards out of a 20″ barrel. A 16″ barrel can do it as well, assuming the load development included a faster powder (XBR8208 has shown great results for me out to 800 yards). After a point, ballistics and drop is just a number. A longer barrel will help with wind drift though and is the reason I still run a 20-26″ barrel on my .308 F-T/R guns. did you just say niggles? + 1. Nick, take care of us. ‘Cause they’re illegal in MA and cannot be possessed by people except for the po-po and FFLs. That’s because of the 1994 AWB, which Romney had nothing to do with at all so don’t blame him. I am going to open a business providing free bikini waxing and massages to Israeli models. Problem is I don’t think there are many of them living in Oregon. “Cheek weld” is really a per user issue. Complaining about it is like complaining that an A2 stock doesn’t fit all user’s perfectly. When you are buying a rifle for long range work, you just have to accept that along with your glass, you will need to get an appropriate stock for it. Unless you are paying over $2k, it’s a fact of life. I see alot of fail in this rifle. I absolutely hate the recoil pad, mine is hollow and colapses with every shot (scope bite). The forearm is not ridgid and deflects onto the barrel when you use a bipod or sandbag rest changing POI. PS this rifle is NOT the M-700 of a few years back! I’m enjoying my 700 LTR in .308 quite a bit. I don’t have the funky stock, but I do have a little more support. Nick, why did you choose the remington 700 SPS Tactical AAC-SD over the Savage Model 10 Precision Carbine? I just recently sold my Remington 700 SPS Tactical and have been researching the purchase of a .308 bolt action rifle with threaded barrel and detachable mags. Honestly, while I think that the newer Remington 700s have slipped in the QC department, I still like them more than the Savage action. Nothing scientific or quantifiable, but to be it just feels better. i have one of these. they are pretty cool, I’ve been waiting for my McMillan tactical stock for mine for a bit as well. Add my night force and presto, super psyched. Bought this very rifle at a gunshow several months ago for $704.00 out the door. Mounted a Burris MTAC 4.5×14 MilDot and a Harris bipod on it. GREAT TRIGGER! Hornady Gold Medal Match 168 grain Sierra HPBT put 3 shots in one hole @100 meters. Seems to want to do it all day long. I haven’t had it on a longer range, but based on this performance, it’ll be interesting to see what it can do out to 600 or so. As to the rough bolt travel, try a bit of very fine valve grinding compound and lightweight machine oil. Make this into a runny paste, coat the bearing surfaces BUT NOT THE LOCKING EARS on the bolt, and operate the bolt several times, in steps, until you’re happy with the smoothness. DO NOT overdo it it! Patience, friends, patience. Be sure to clean ALL residue (which will require a complete action dismount and strip), and lightly oil all bearing surfaces with light gun oli. Again, don’t overdo it. You’ll be amazed at what this will do. Can’t wait to finish breaking in the bore, and firing up the Rock Chucker. As to the stock “free float”, a little judicious Dremel work will cure that problem. Like Jodey Foster in “Contact”, small moves = good results, and will not be visible. Still waiting on the approval for the can. has anyone noted that totally buried in the review is the fact that this rifle is a BA 300 BO/308? Why does everyone keep talking about need LEO signature to get a Class III weapon? You don’t need the sheriff to sign anything. You can form a revokable trust or a corporation and get the class III assigned to it without LEO signature, finger print cards or the back ground check. I live in AZ where they actually will sign the class III stamp, but I still use a trust because it is a handy legal tool, and it takes about 30% of the time as it would to do it as an individual. Doesn’t everyone know you can do this? I thought begging sheriffs for signatures was a thing of the past. I didn’t know about it until it was too late, then my dealer pointed me in the right direction. You see, elections have consequences, and my new town chief wouldn’t sign when it eventually came in. I’m loving having it now though. Worth every penny. I can file form 1 online now, and NFA tracker is showing Efiled form 1’s coming back in about 1-3 months. I Efiled a form 4 and got it in 5 months, back when you could still do that. I just bought an AAC SD last night (picking it up on Friday) but living in PA, I won’t be installing a can…they are leagal here, but require a 200.00 fee under NFA…so rather than spend 800-1000 for a suppressor, I’m probably going to go with a much more cost effective JP Recoil Eliminator (100-110)..just not sure if I can get one for the correct barrell size that isn’t stainless yet. What type of AAC silencer did you use on your SPS-Tactical AAC-SD? I’ve checked their website and they have a good variety for .308, how do you no which one will work with the rifle? I use the AAC 762-SDN-6. It works perfectly for every gun I own. Thank you for the article. I enjoyed your experiences. Which suppressor and scope is pictured please? AAC 762-SDN-6 silencer, Primary Arms 4-14×44 FFP scope. When you talked about the stock touching the barrel when using a bipod you said it was a “quick fix”. What did you do exactly? Just sand out the stock at that point with a rotary tool until the flex didn’t make contact? i just got me an acc i think for the money is pretty darn good, about the can,…well i have to save some more money for that, for the scope i got a leupold mark 4- 6.5-24 x 50 on it and is perfect for it and a primary weapons systems pws prc 5/8-24 muzzle brake for it until i get my can, and a harris 6-9 br bipod on it, we had a lot of fun with it at the range, and this thing is a tac driver, we shot 100, 200, and 300 yds. with it. …..i am no expert at this stuff, but i have to say that for an average joe this is an affordable, good and pretty accurate piece, i highly recomended. mmmmm. thanks my friend i am going to check on that trigger guard, hope you catch a big one. Needed a little fitting, mostly had to remove some of the stock’s rubber. I bought one because of this article, and I must say I am quite fond of her. I don’t have a can for her, but I did put a muzzle-break on. I’ve successfully been hitting the targets at 500m, and Im hoping to find range with more distance to see how far I can push her. You’ll shoot your eye out !!!! Looking for a small caliber handgun for my wife, was looking at P22 Walther, they come in pink and other colors for women. Smith & Wesson .38 lady smith hammer less was another option. Any ideas ???? Fill out this issue, this can be this h2 tags that sees as they quite simply search over the directory of articles in a unique class, go through the post meaning press button. If you’d like to stay nameless, it is possible to produce a reputation to make use of, as long as this mailman will certainly provide it. **JUST Be certain Every one of the Details Tend to be Right. ** Today, all the A few individuals whom simply just mailed us $1.00 make Bare minimum 2 hundred articles, each with my personal identity during #5 for A few individuals reply to all the unique A few, that is definitely an additional $25.00 for me, right now people Twenty five each create 2 hundred Bare minimum blogposts with my personal identity during #4 for A few responds each, I’m going to get one more $125.00! Today, people 120 individuals publish and also post this Bare minimum 2 hundred with my personal identity during #3 for get A few responds each, I’m going to create one more $625.00! Okay, right now right here is the fun element, at the same time 625 individuals post a nominal amount 2 hundred emails with my personal identity during #2 and so they each just get A few responds, that only forced me to $3,120.00!!! Individuals 3 or more,120 individuals will certainly almost all provide this kind of meaning to help 2 hundred newsgroups with my personal identity during #1 and when even now A few individuals per 2 hundred newsgroups react I’m going to get $15,625,00! With the unique expenditure of only $6.00! AMAZING! As soon as your identity is no longer available, you merely consider the hottest posting while in the newsgroups, and also mail an additional $6.00 to help titles available, getting a message during variety 6 yet again. I have the Remington 700 AAC-SD with the 16.5 inch barel. I’m just getting into reloading and was wondering what your recipe is for subsonic .308 in this gun. My can is at the shop and waiting for my form 4 to come back. Thanks! While there may have been several bolt action models made by Remington in the 40s and 50s, the “Remington model 700” did not come to market until 1962. The 721 and 722 came out in 1948 and the 700 was based on them. And that “well refined” bolt handle you speak of has been the same designsince the Models 721 and 722. The Model 30 (predecessor to the 721, 722, 725 and 700) had a more Enfield looking bolt handle. I have both one in 308 and 300AAC, however after learning of Freedom Group’s treatment of AAC in the acquisition, I no longer purchase any of their products. i have had this rifle for about a year now and i try to shoot it every weekend. i use 175gr or bigger rounds as they actually help stabilize the rifle. my local range goes to 550 yards and this rifle can put moa to sub moa groups down every time in every weather condition. love it love it love it. favorite rifle i own. What height rings were you using? I think all you DILBERTS mean to say SUPPRESSOR and not silencer. There is no such item.. EVER! Even AAC website uses the term “Silencer”. Hey i was just wondering what kind of scope that was. Just bought my R700 Tact AAC-SD – and my new Leupold VX-3i 3.5-10x40mm CDS Matte Wind-Plex arrives 22 March. Have 24-years in the Army with a number of my Army/Marine precision shooting brothers highly recommending the rifle and the scope. Why this scope? Read about it. May likely be the most versatile scope to buy if you like switching time between the range and hunting. Its’ new for 2016. After my install/boresight, I’ll head to the range with some Federal Premium gold match 168r and Hornaday 168gr match TAP Amax for the zero and some initial trials. I can’t wait! I was wondering about scope mounts for it. I plan on LONG range shooting so want a 20 MOA rail. But I worry about being able to load the rifle easily with a solid rail. I was looking at the EGW rail for it. Also, any idea what height scope rings would I use? Scope is an SWFA SS 10X42M. Corrsion X thick or thin. Yep. CorrosionX is the best bet to protect the rifle from rust as well as a great lubricant. Works best in crummy motorcycle tanks after they’ve been drained, dried out and the filter has been hacked open and emptied out like a pepper shaker Heh heh… and then replaced. I read this post only yesterday. I see you’ve thought about the Remington 700 SPS tactical earlier than us. To read this blog I think the gun as a handgun the best for using. But I don’t expect you to end your discussion on the specific matter so soon. Can’t you please share more of your insights into it? Really, our neighbor groups who visit this website- Spottingpro oftentimes would be happy. Thanks a lot, Nick Leghorn. Not much point in a a can without the Subsonic..